Go Digital! is the buzzword today and most of companies are aggressively going online. Today you can buy books to insurance, everything on net. Thankfully Indian regulators are not behind. Weather you are investor or consumer, you can register your grievances and complaints online and rest would be taken care by regulators. Here’s a brief on where to go in order to file grievances online. SEBI is stock market regulator and it has developed SCORES, short for SEBI Complaints Redressal System. You can access this at http://scores.gov.in .You can file complaints against the gamut of entities involved in stock markets, from brokers, depositories, registrars and transfer agents to mutual funds, portfolio managers, and even the stock exchanges themselves. For instance, you can lodge complaints against companies for wrongs such as non-receipt of dividends, bonuses, letter of offer for buybacks, and much more. You can also blow the whistle on insider trading or price manipulations using this site. All it requires is for you to register on the site which is free. You must compulsorily provide your email address, address for correspondence and PAN for registration. An email will be sent giving login details which you should use to manage your account on the site and file complaints. Once a complaint has been filed, its status can be tracked using your account. What’s more, you can send a reminder if you feel there’s been too long a delay in redressal. 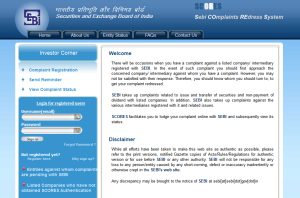 SEBI can also request clarifications on any complaint filed, which can be done through the Web site. Supporting documents to your complaint may be uploaded as well. The procedure to lodge banking complaints is similar to that of insurance, though involving a bit more effort. Go to RBI Website. The Web site allows complaints against banks and the RBI itself. So, under the ‘Complaints’ section in the website, choose ‘Banks’, then the ‘Banking Ombudsman Scheme’ and finally ‘Addresses of Banking Ombudsman’. Based on your location, choose the email address and send an email with details of the complaint. Insurance and banking complaints may be made only if you have already approached the insurer or banker and have not received a satisfactory response, or have been ignored or rejected. A representative such as an advocate cannot file a complaint on your behalf. Suppose you bought tickets online, cancelled them later and are enduring an endless wait for the promised refunds. Log on to http://core.nic.in. This portal is for the education of the consumer and has facilities similar to the SCORE site to lodge complaints. 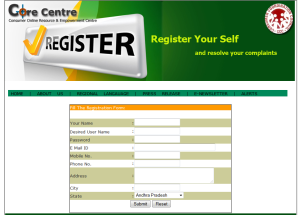 The portal is run by the Consumer Online Resource and Empowerment Centre (CORE), a group of 55 consumer organizations and is supported by the Department of Consumer Affairs. Consumer complaints can be filed against all sellers, whether they are for goods or services. Here too, you need to register and create an account in order to register a complaint. 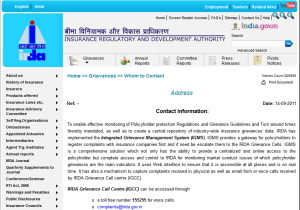 Besides seeking redressal for grievances, you can get doubts clarified, ask for information relating to consumer affairs, and so on through the site. It is not necessary to have first addressed the seller of your grievance. A toll-free number is also provided on the site for lodging complaints. You can read up on previous judgments, glance at the entities against which complaints have been filed. The CORE group even publishes monthly progress reports, if you are inclined to check. 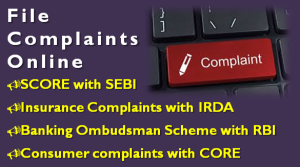 Online filing of complaints is a great initiative by these respective regulators and watchdogs but steps should be taken to publicize it and make websites more robust and user friendly. There are also several loopholes in the way complaints are handled. Many a times the complaints may not be resolved to the satisfaction of the customers! But still if you are frustrated with some of the services its time you file the complaint and see if you can take it to logical conclusion! This is good info. I have bookmarked the page. Good to know it was helpful for you. keep coming back for more! Could you please share, what is the right forum to put a complain for Infra Bonds?